IMAK Back Cushion Orthopedic Lumbar Support from HealthyKin.com offers superior comfort and lumbar support for your car or office chair. The unique design hugs your lower back to help improve your posture and reduce stress to the back, thereby reducing low back pain. The IMAK Back Cushion and Lumbar Support features large and small vacuum-formed air pockets, which provide a 'pressure point massage' to your back. 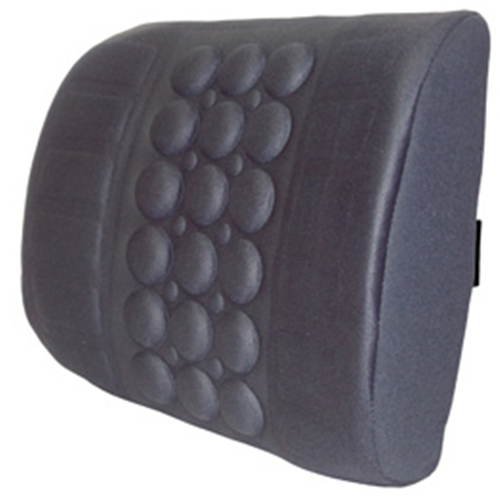 Our Back Cushion provides comfort and pain relief whether you are at home, at the office or on the road. Use the IMAK Back Cushion and Lumbar Support to relieve back pain, especially low back pain. Also helps achieve ergonomically correct seating in office, home and car. I have been using this lumbar support for a week and it is wonderful. I use it in my Toyota Highlander. I consider the seats to be very uncomfortable; forcing you to sit in the shape of a C. The lumbar support fit my small frame well (5'-5", 120 lbs). Just what I needed! I use it in my vehicle. Great back support! I might buy another one! I recommend it. Also good for the price. My husband and I have tried several styles of lumbar pillows and both agree this is the best! We now both have one. Helps with my wife's posture in the wheelchair. I highly recommend this product. Great quality for the price too! After a week, this is helping. I am concerned though that it might not hold up well.